Maldaba are the Good Guys – Maldaba Ltd.
Maldaba are the ‘good guys’ according to Hope Caton and Robin Bell, founding directors of London-based start up digital health technology firm Healthy Games. Hope and Robin approached Maldaba with a view to creating a data capture system for their Cigbreak mobile phone game which encourages smokers to kick the habit by breaking cigarettes. Hope, writer of the global hit video game TombRaider IV: The Last Revelation, commented: “Cigbreak is a game based on Fruit Ninja that helps smokers to quit. The aim is to negotiate a series of levels and reach the Smokefree finish line. By breaking the cigarettes you break the habit. 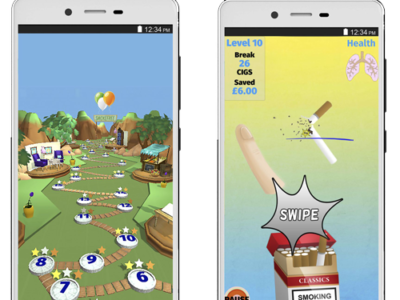 “It is the UK’s first smoking cessation app in the form of a game. Research shows that when a game mechanic mirrors the desired behaviour change in the virtual world, this change is continued and maintained in the real world. “A Canadian study proved that if smokers play a game that involves breaking or crushing cigarettes, they are 13% more likely to quit. It also indicated that 52% of video game players smoke while 37% of non-video game players smoke. “The study also showed that 63.7% of smokers believed computer game-based intervention would motivate them to quit,” added Hope. Business partner Robin added: “We have had a good experience with Maldaba. What impressed us was their understanding of start up businesses such as ourselves. “We had to develop a data capture system on the back end of the game but we had no experience of how to do this. Maldaba made the whole process easy to understand. “We are aiming to work with public health bodies so therefore we’re required to collect data and feedback from users of the game as to whether it worked and helped them to quit cigarettes. “Maldaba are good guys and very easy to talk to and work with. I would recommend them to any tech start ups such as ourselves,” concluded Robin.